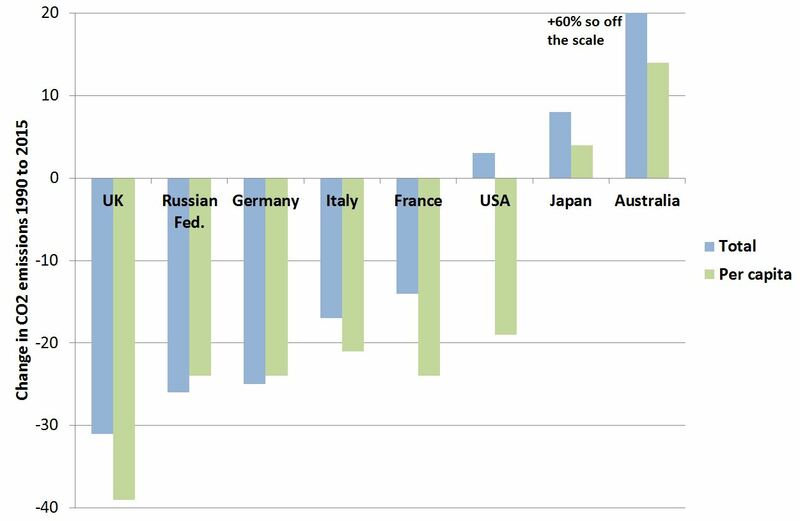 The UK has outperformed all other major economies in emissions reductions since 1990. This offers lessons for both the UK and others. In my previous post I described how the UK has made good progress towards its legally binding commitment to reduce emissions by 80% from 1990 levels by 2050. This post compares emissions cuts in the UK with those elsewhere. Since 1990 the UK has reduced both total and per capita emissions more than any other major economy (see chart). The UK’s lead would be greater if emissions reductions in 2016 were included, because UK emissions fell by a remarkable 6% in 2016 alone, mainly due to falls in emissions from the power sector. This is despite the percentage fall for CO2 from the UK (shown here) being smaller than when all greenhouse gases are taken into account. Emissions from the Russian Federation have also fallen significantly, but this reflects the very high level of emissions in the Soviet Union, with its huge and pervasive inefficiencies. All of the decrease in emissions from the Russian Federation was in the 1990s. Germany has also benefitted from reduction in emissions in the former East Germany and has made good progress in other respects, notably with installing renewables. However it has been hampered by continuing extensive use of coal and lignite for power generation. Emissions reductions in France have been somewhat less, but this remains a very creditable performance because France started with a very low carbon power sector, consisting almost entirely of nuclear and hydro. There were thus fewer opportunities for emissions reductions. Despite the lower percentage fall than in the UK, France’s per capita emissions in 2015 were still almost 20% below those of the UK (5.1 tonnes per capita in France compared with 6.2 tonnes per capita for the UK). The USA has accommodated significant population growth with only a small rise in emissions, but this is clearly nowhere near enough if it is to make an appropriate contribution to global reductions. Emissions remain at 16.1 tonnes per capita, more than two a and a half times UK levels and more than three time French levels. Japan’s emissions have been largely constant through the period. Australia has done notably badly. China’s emissions (not shown) have roughly quadrupled over the period, reflecting its rapid, carbon intensive development. While there have been many factors at work here, the UK approach to policy has played its part. Policy has successfully targeted relatively low cost emissions reduction, notably reducing coal use in the power sector. Above all the Climate Change Act (2008) has provided a consistent and rigorous policy framework. There will doubtless be some who argue that outperforming others to date means the UK needs to do less. But this is very far from the case. Others need to catch up to what the UK has achieved, for example by eliminating coal use. Power generation from coal currently accounts for just under a third of the total emissions from energy and industry globally. And the UK itself still needs to stick resolutely to its goals, and meet the challenge of continuing decarbonisation now many of the cheaper and easier things have already been done. But others can at least look at lessons from the UK experience and see what there is to learn that could apply to their own circumstances. The percentage reduction for the UK is less than quoted in my previous post, mainly because the data in this post is for CO2, so excludes large reductions in UK emissions of methane, mainly from waste, and N2O, mainly from industry. There are differences between sources of data for CO2 only, but these are small. The Edgar data quoted here shows 580 million tonnes in 1990 falling to 400 million tonnes in 2015 (31% fall). The UK Government’s data shows CO2 emissions falling from 596 million tonnes to 404 million tonnes over the same period (32% fall). The UK’s 2015 final greenhouse gas emissions inventory is available here: https://www.gov.uk/government/uploads/system/uploads/attachment_data/file/604351/2015_Final_Emissions_data_tables.xlsx. This entry was posted in Climate change policy on 09/05/2017 by adamwhitmore.